ALBANY, NY (WSKG) – Progressive-leaning groups said Wednesday that now that more Democrats have been elected to the state Senate, they’ll hold the legislators’ feet to the fire in January to ensure that measures like bail reform and legalizing marijuana are swiftly enacted into law. The groups said they’ve been pressing for years for measures, including ending cash bail, providing more higher education access to prisoners and ending solitary confinement. They say they are encouraged by the election of 40 Democrats to the state Senate, and want lawmakers to include some of the reforms in the state budget. Klarisse Torriente, a community activist in Albany, along with representatives from the other groups, braved a bitterly cold November day to speak just outside the entrance to the State Capitol. Torriente said she’s been working for the past five years coordinating prisoners’ access to higher education, but she said only half of the state’s 54 prisons offer anything more than a high school equivalency certificate. “Enough is enough, we want our folks to return to their communities well-prepared to serve and to care for their families,” Torriente said. 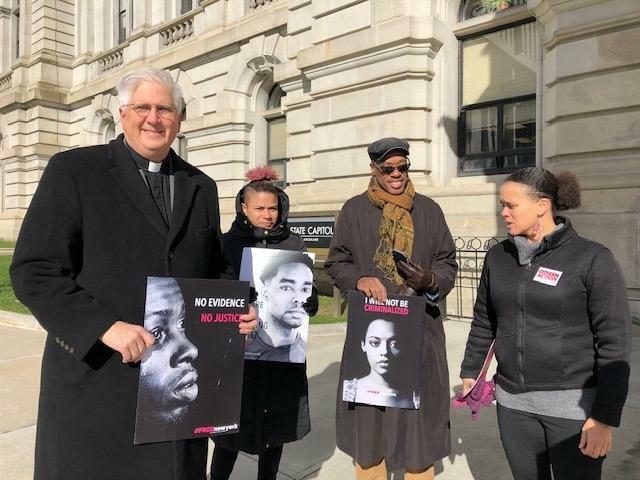 Peter Cook with the New York State Council of Churches said the state’s cash bail system often forces low-income people who are accused of crimes to await proceedings in jail, where their lives spiral even further downward. “You can lose your house, you can get kicked out of school, you can have your car impounded, and you are put on a trajectory of poverty,” Cook said. Cook said the Council of Churches plans to release a budget document in the next couple of weeks, before Gov. Andrew Cuomo releases his spending plan in January. Cook said it will show how making changes away from mass incarceration would save the state money that can be used on other things, such as infrastructure and education. “Mass incarceration is not only morally wrong, but it’s really expensive,” Cook said. The state Senate’s new majority will include several members from more conservative parts in the state, like the New York City suburbs of Long Island and Westchester. Jamaica Miles with Citizen Action said that should not deter action on the criminal justice reform issues. She said legislators need to listen to voters who replaced six of eight conservative-leaning breakaway Democrats in the September primary, and defeated several Republican senators in November’s election.